On the way back at Islamabad on my last visit  I had to give one fool £10 as he kept harassing me. This was at baggage check. Pakistan is a deep deep mess. It will be decades probably before I go again. LAHORE (Dunya News) – Ismail from Arifwala had arrived at the Allam Iqbal Airport from Abu Dhabi. According to him, gold disappeared from his luggage during the checking by the staff. The airport authorities took the routine action and asked the passenger to come again after a few days. Ismail said he had fetched the lost golf for his sister who was being wedded after some days. ISLAMABAD: Prime Minister Nawaz Sharif has asked the Aviation Division of the federal government to convert all the airports in the country as ‘Passenger Friendly’. This was revealed by Nargis Sethi after taking additional charge of the Aviation Division here on Thursday. She reached Islamabad Airport immediate after assuming the new task without prior notice. The Managing Director of PIA was also present on the occasion. She monitored the working at the airport by inspecting the site, meeting passengers, receiving flights and overseeing departures. She took serious notice of the leaking ceiling of the airport roof after the rains. She instructed the airport authorities to take immediate steps to repair it and save the passengers from inconvenience. She also informed the authorities concerned that Prime Minister Nawaz Sharif wants to seepassenger’s friendly airports, therefore the airline and airport must take all necessary steps in this regard. She said people must not wait for long for their luggage. She stayed at airport to see the departures and see the airplanes. She remained at airport for two hours, handled two flights one incoming from Karachi and other going to Lahore. She directed Airport authorities to immediately take steps to give better look to the airport. She also met some passengers during her maiden trip to the airport. Nargis Sethi takes notice of the non-availability of PIA staff at international departure lounge. Secretary Civil Aviation Nargis Sethi paid a surprise visit to Islamabad Airport today and took notice of the non-availability of PIA staff at international departure lounge. She ordered the opening of all the counters of international departure and deputed Civil Aviation staff at the lounge. ISLAMABAD: Secretary of Civil Aviation Pakistan, Nargis Sethi, has paid unscheduled visit to Islamabad airport on Sunday. The secretary's unscheduled visit became troublesome for the absent staff members as she took notice of non-availability of the employees at the Benazir International Airport Islambad. Sethi observed the closure of several counters of international departure section due the absence of Pakistan International Airport (PIA)’s staff. Nargis Sethi ordered to open all international departure counters during her visit and asked to provide name list of all absentees. my personal experience this summer at Lahore airport was REALLY bad, as it became a warzone of getting your luggage first, aggressively and no proper procedure to get your luggage screened before leaving off to be received by familymembers. ^ Where is the exact location and how far away from the present airport? Im not sure about the exact location as it is in the middle of uninhabited land, but its a bit near to Islamabad sector I-16. Maybe about 40-50 km from current airport. This is what the renders suggest it will look like, although we can expect some differences when its complete, but so far it seems pretty close. Are they going to share the runway with the current Chaklala airport or is it totally separate? Its totally separate. They have built 2 runways and are trying to acquire more land for a third. Its suppose to open in April 2015. When coming from Rawalpindi, on GT Road, towards Peshawer. There is a junction which connects GT Road, Peshawer Road and the freeway/high way which is around 20 minutes by car, from that point. Tarnol is towards Peshawer, around 10 minutes from that point as well. PAF Tarnol is located to the airport. I am going to visit someone in Tarnol, and have been recently studying google maps whats in the local areas. The exterior looks pretty neat and modern. However I saw pics of the interior and was dissapointed, very outdated. 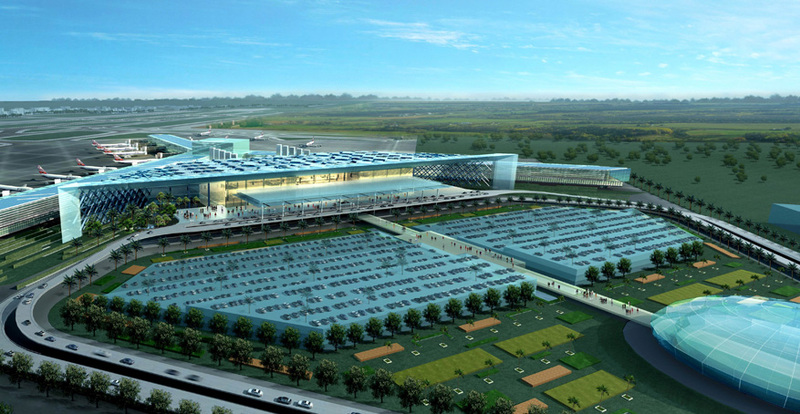 They have planned only 9 jetty's (air bridges) and maximum 9 million passengers per year. Although another air bridge can be added without much construction making it 10, but still very poor future planning. I mean today even 5 jetties are too much, but 25 years down the road? Room for expansion is only 4-5 jetties. They can't expand more than 9 million passengers per year as they have just that much space for baggage arrival belts and booths for immigration officers for arrival. The best performance during the good investment days of the 2006-2008 era was little over 3.5m passengers per year. Perhaps 9m capacity planning for the next 30 years is sufficient? Edited by Felicius, 28 June 2014 - 12:13 PM. I recently came back from Pakistan. .. The service from Islamabad airport personel was really friendly. Security check of the luggage was very smooth, no rush or extraordinary. The document checking before check in was great I chit chatted with a person called Muhammad Saleem a very happy and humble person. The lady who sat at the check in counter greeted very respectfully. Although she forgot to give a tag for the cabin baggage there was nothing wrong else. The immigration officers were helpful and friendly. They told me to get the cabin baggage tag but when I returned to get my passport rechecked they told me to go straight to the cabin baggage security check before going up the stairs for the big airport waiting hall. I was impresssed to see that newer flat screens gave flight information. The whole waiting hall saw repainted and fresh. There is some new policy after the incident on Karachi airport and the attack on the PIA flight to Peshawer, that redundant kullis and people are not allowed inside the airport areas. When I landed at Lahore airport there was a lot of security flaws that could be seen... tje fencing areas were vulnerable and the public could get close to the fencing areas which is about few hundred metres away the airport terminal. ..